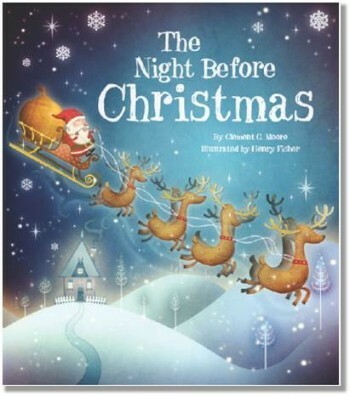 The Night Before Christmas by Parragon books is the perfect book to read to children on Christmas Eve or anytime on the run up to Christmas. This Parragon picture book is a lovely quality with beautifully illustrated full colour pages by Henry Fisher that are sure to delight any young child. The front cover is glittery and gives a magical feel to the book. Written by Clement C. Moore this delightful story about The Night Before Christmas when Father Christmas took to the skies with his reindeer pulling his sleigh delivering presents in the quiet of the night is a pleasure to read. With it’s rhyming lines, children are eager to hear what happens next and use the pictures to help bring the story to life. My two children love this and it has been on the reading pile every night. They find the story enchanting and love the excitement of the quick paced tale. I’d highly recommend for everyone to read this to their children through the festive period. It really helps keep the spirit of Father Christmas alive!! This entry was posted in Reviews and tagged books, childrens, Christmas, night before, parragon, rhyming by Fiona Martin. Bookmark the permalink. Mummy of Two recently posted…A tea party!